"I would like to thank all the people who awarded this site. 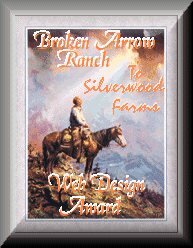 I try to only apply for awards that are difficult to win and where the folks who award them take the time and effort to go over my site, they help with suggestions and comments of ways for me to continuously improve silverwoodfarm.com . It's a time consuming process for them and again I really appreciate these awards, I am honored to receive them-Thank you!" 'horse-person' but I AM what you would call a 'web-page' person, and you have done a remarkable job with the material on this site. Your hard work and effort is obvious! Your color use is interesting... I can read your pages with no trouble at all. Navigation is pretty durned slick... good marks there! Graphically, the site is excellent...overall a fantastic job! So, it is my pleasure to award you the 30-something-th Gazoo's Gold Choice Award. I never award sites without darned good reason, and your site has definitely earned the award. Thank you! Astrid, I am very happy and honored with my gold award! Congratulations, your website has won the golden Equine Website award. Why gold? First of all your graphics are outstanding, the layout is excellent and the whole page is a nice gathering of equine information. 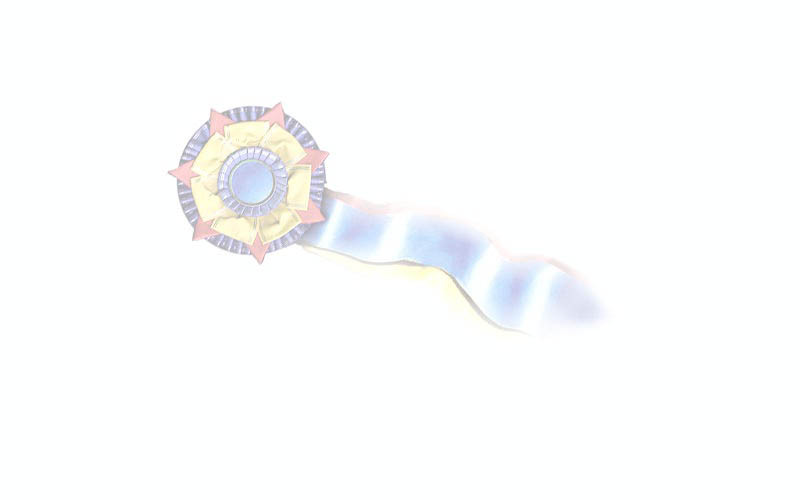 Please be happy with the gold award because you are only the third page which got that award. This is the first award I ever applied for about a year ago-I was thrilled to win it. Thank You John! "I am very pleased to give you my award, I am trying to be very select with the sites I give my award to, I want it to be something special when you see it in someone's site and be proud to have it your own site. 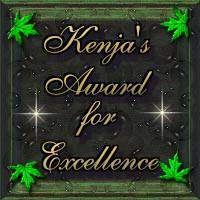 Your site is one that I would be proud to see my award being displayed. Thank you for applying for it." 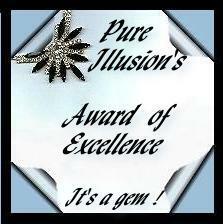 "Congratulations from Pure Illusion Awards. We are honored to inform you that you have won the "A Step Above the Rest" Currently only 14% of the people that apply win and yours is the first award of excellence given out. You have done a fine job." 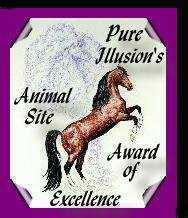 You have won The Black Eagle Award for a GREAT animal page. You are from now on under the wings of the eagle. We have looked very sharp at your page and we love it. There are some FANTASTIC graphics shown and the content is really interesting for a lot of people. It's easy to navigate and everything works! You have done a GREAT job on them. Your page is now in the claws of The Black Eagle. He NEVER let loose again! Congratulations Liz Hall! You have been approved to become a part of GAR Network! Due to the extremely high quality of your website, you have won the GAR award. It is the decision of the GAR staff that your site does indeed stand above others in its graphic quality, site organization, and overall attractiveness. We gratefully appreciate the existence of such sites on the Net, and hope that through this award, the leaders will become more visible to the public. 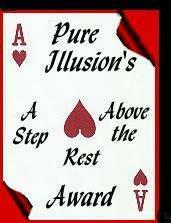 "Congratulations from Pure Illusion Awards. We are honored to inform you that you have won the "A Step Above the Rest" Currently only 14% of the people that apply win. You have done a fine job." Thanks again and again Sandy Groff! © 2001-2013 All images/materials on these pages are copyright protected and can not be used without written permission from Silverwood Farm, Lizard Graphics and or the various Photographers. Silverwood Farm: The worlds Finest collection of Pinto Sporthorse Stallions. Standing at Stud: Art Deco, Hall of Fame, State of the Art and Spectrum.